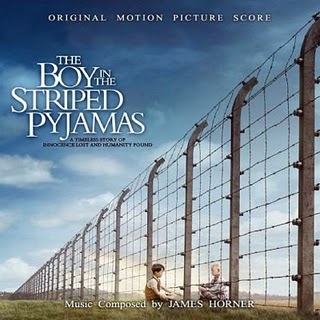 The Boy in the Striped Pyjamas, directed by Mark Herman from the novel by John Boyne, is a harrowing, yet life-affirming drama set in the Auschwitz Nazi concentration camp during World War II. Bruno (Asa Butterfield) is the 9-year old son of the camp commandant (David Thewlis); not understanding where he is or why he is there, and bored with his life away from the city where he used to live, Bruno makes friends with a young boy named Shmuel (Jack Scanlon), who lives on the other side of a wire fence and wears ‘striped pyjamas’. The innocence of their friendship soon becomes strained, however – Shmuel is Jewish, and is of course scheduled to die in a gas chamber. Critics have lauded the film, both for its delicate handling of the difficult subject matter, and for its performances. Similarly, James Horner’s score has been pretty much roundly praised, especially during the emotionally overwhelming finale. It’s been quite a while since Horner was attached to a film with such an important subject matter and such a positive critical reaction. Horner apparently sought out director Herman and lobbied to score the film, so it is clear that Horner had a great deal of interest in the subject matter. Being Jewish himself, Horner also likely had a real personal interest in scoring the story. As one might expect, given the nature of the film, the score is generally quite serious and profound, albeit tempered with a certain sense of innocence to capture Bruno’s world. Also, as one might expect, the score is drenched with ‘Hornerisms’, and the usual references to scores of the past. As is always the case, your enjoyment and appreciation for the score will be determine in part by your ability to overlook this and experience the score for what it is. The score is performed by a full orchestra, with special emphasis on piano and strings, and is augmented by a great deal of synth work, which is becoming increasingly frequent in Horner’s work over the last few years. The main theme, as heard in the opening “Boys Playing Airplanes” is a note-for-note restatement of the bittersweet theme which first appeared in the cue “The Letter” in Swing Kids back in 1992, albeit this time performed on solo piano, with ornate syncopations and embellishments, which give it a sense of lightness and fluidity. I suppose one could make a case for thinking that this theme is a recurring ‘Nazi’ theme for Horner, as both Swing Kids and this film have similar subject matters, but that could be a stretch, even for apologists like myself. It is what it is, and no-one can deny that the theme is beautiful, regardless of when it as written. The theme appears frequently throughout the score, often tempered with different colors, and subtly altered to give it varied moods. There is a hint of hesitancy and uncertainty to the first part of “The Train to a New Home”, for example, before it opens up into a lovely, hopeful performance, while “Black Smoke” adds a dark, ominous element to the score, which ushers in the change in tone for the score’s second half. Elsewhere, there’s a definite pastoral feeling to “Exploring the Forest” and the gorgeous “The Wind Gently Blows Through the Garden”, where the lilting oboe passages and soft, intimate piano chords combine to wonderfully moody effect. Horner has always been good at evoking the subtle sounds of nature through his music, as scored like The Spitfire Grill and The New World attest, and these more abstract parts of the score continue in that vein. “An Odd Discovery Beyond the Trees” introduces a solo vocal performance which recalls Charlotte Church’s contribution to A Beautiful Mind, a beguiling, undulating, mesmerizing piece where the piano and vocals are accompanied by a dreamlike synth note, giving the cue a sort of other-worldly feel. It is in the final two cues – “Strange New Clothes/An Impending Storm” and “Remembrance, Remembrance” – that when Horner really cranks up the emotional impact of the score. The latter part of “An Impending Storm” contains some of the most unsettling dissonance Horner has written since The Perfect Storm: a cacophony of those familiar dark piano chords and groaning, weeping strings, which gradually become simply overwhelming. Somewhat oddly, the string writing here sounds like a deconstructed version of the theme from Glory, twisted and tortured around into something quite disquieting. The score concludes in reflective mood with a piece which, while initially reminiscent of parts of Brainstorm, eventually emerges into an appropriately respectful and undeniably moving solo piano performance of the main theme. Possibly the only misfire cue is “The Funeral”, which features several instances of the dreaded ‘four note motif’ on a soft solo trumpet above a bed of Braveheart-style synth strings, and which is likely to make anyone familiar with any of Horner’s earlier scores burst out laughing (which, unfortunately, was my first reaction). It’s a shame Horner doesn’t recognize this effect the four note motif has on his audience in 2008, because it is likely to take anyone listening (or watching) out of the movie at an important point. Irrespective of your feelings about Horner’s self-referencing, the sense of tragedy and drama Horner brings to his score, especially during the finale, is palpable. The fact that it manages to walk the line between utter horror and inhuman tragedy, and the innocence of young boy experiencing a situation he doesn’t understand, is masterful, and once again illustrates Horner’s impeccable talent as a musical dramatist and a tasteful manipulator of an audience’s emotions. The film opens in the United States on 14 November 2008, and if it is received as well by American critics as it has been in the UK, I sense Oscar nominations, both for Horner and for other members of the production. Music composed and conducted by James Horner. Orchestrations by James Horner. Recorded and mixed by Simon Rhodes. Edited by Jim Henriksen Album produced by James Horner and Simon Rhodes.